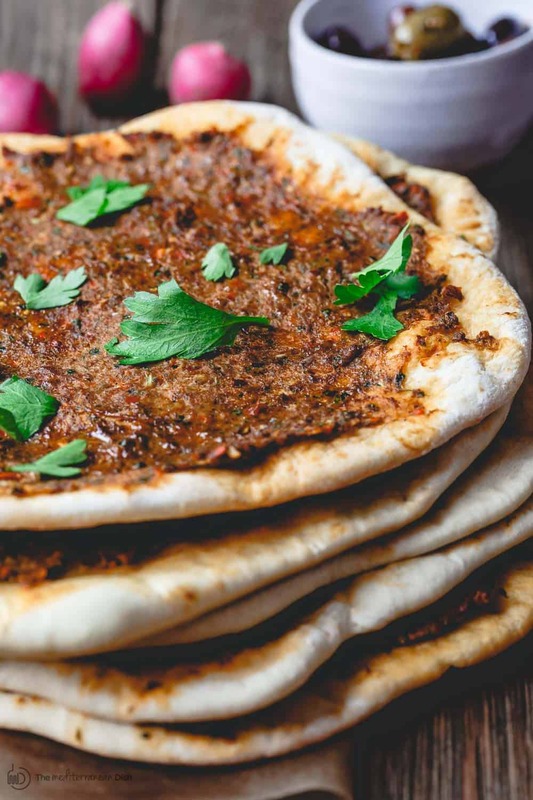 Think of Lahmacun (Lahamajoun) as super thin, crispy Turkish pizza (or Armenian pizza), topped with a flavor-packed mixture of minced meat with peppers, tomato, fresh herbs and earthy spices. I take a major shortcut by using quality store-bought pizza dough. But the secret is in the spice mixture! This lahmacun recipe is the perfect prepare-ahead lunch. And it’s a great dinner on-the-go. To serve a crowd, slice it up and serve with other Mezze favorites. See serving ideas below. I’ve always had an affinity for Turkish food, perhaps because much of it resembles what I grew up with in Egypt. But it wasn’t until my trip to Turkey a few years ago, that I got to taste the real deal. And as much as I enjoyed fancy restaurant meals while touring, it was simple foods like Turkish fried eggplant and Lahmacun that stole my heart. 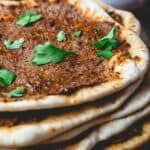 What is Lahmacun and Where is it From? Flatbreads have been a popular thing throughout the Mediterranean for ages–from Italian pizza, to za’atar manaqish from the Levant, and Lahmacun from Turkey and Armenia. 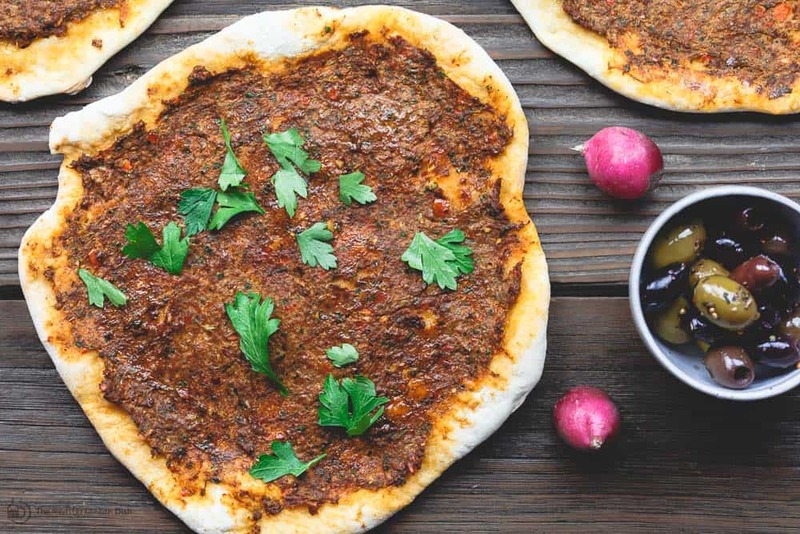 Lahmacun, pronounced “lahma’joun”, comes from the Arabic “lahma bi’ajeen,” which literally means “dough with meat.” Think of lahmacun as perfectly thin, crispier pizza (or flatbread), topped with a spiced minced meat mixture. Lahmacun has two different components. The dough and the meat topping. 1- The dough. I hope my Turkish friends will forgive me, I took a major shortcut with the dough here using quality store-bought pizza dough. It works very well. But if you want, you can certainly make a homemade pizza dough from scratch or use my dough recipe for manaqish. Whether you use store-bought dough or make your own, the important thing to remember is that you need to spread the dough well to achieve a very thin flatbread that crisps around the edges when baked. 2- The meat topping. Traditionally, Turkish lahmacun is made with minced lamb, but you can also use lean ground beef. What makes the topping special is the combination of flavors. In this lahmacun recipe, I use a food processor to create the topping. Ground lamb (or beef), mixed with sweet red peppers, shallots, garlic, tomato paste, fresh herbs, and an epic fusion of spices! I played with the spices and arrived at a complex, earthy, warm blend of: smoked paprika, allspice, cumin, Aleppo-style pepper, a dash of cinnamon, and a pinch of cayenne. You can omit the cayenne if you need to, or add more if you like the heat! 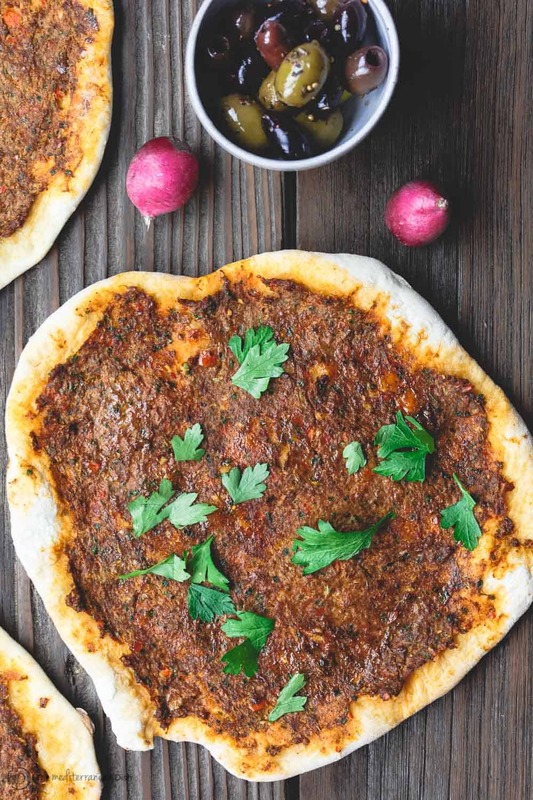 To make lahmacun, the idea is to spread the spiced meat topping very thinly across the dough. You can bake the lahmacun briefly until the topping is well cooked through and the dough turns nice and crispy around the edges. 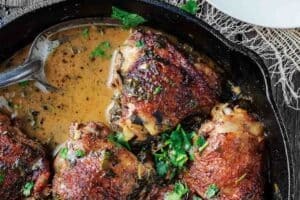 Or, if you don’t feel like warming up the oven, you can try the stovetop method using a large non-stick skillet (see recipe notes below). Lahmacun is a popular on-the-go Turkish food. When you visit Turkey, you’ll see people walking the bustling streets of Istanbul, lahmacuns in hand, wrapped up like burritos. To serve lahmacun wraps, all you need is a squeeze of fresh lemon juice on top. Add a few slices of red onions, fresh mint leaves, and maybe a few radish slices. Wrap up and enjoy! Or, to serve a larger crowd, you can slice lahmacun up like you would a pizza and add a drizzle of tahini sauce. Consider adding more mezze favorites on the side like this easy Mediterranean salad and roasted garlic hummus. 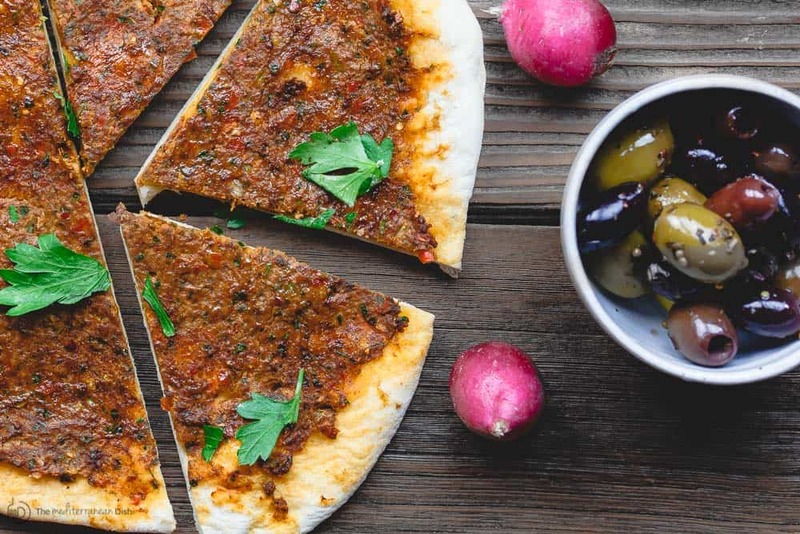 Think of Lahmacun (Lahamajoun) as super thin, crispy Turkish pizza (or flatbread) topped with a flavor-packed mixture of minced meat with peppers, tomato, fresh herbs and earthy spices. I take a major shortcut by using quality store-bought pizza dough. But the secret is in the spice mixture. Divide the pizza dough into 4 equal balls (about 2 oz each.) Working with one ball of dough at a time, place on a floured surface. Using a rolling pin, roll dough out into as thin as you can to a disk that’s about 8 or 9 inches in diameter. Assemble Lahmacun. Place one flatbread disk on one of the prepared pans. Reshape as needed. Spoon 3–4 tbsp topping onto dough and spread topping evenly to edges, leaving a thin boarder. Repeat steps 5 and 6 with the remaining dough. Squeeze a little lemon juice on top. Serve Lahmacun hot or at room temperature. See notes below for how to serve. Cook’s Tip: if 1/2 lb pizza dough doesn’t seem enough for you…if it’s not giving you enough for your crowd, you can go ahead and use 1 lb pizza dough. The mixture should still be enough. If you need to feed even more people, and you need to use more pizza dough, then simply double the meat topping. Cook’s Tip for How to serve Lahmacun: Before you serve, squeeze just a little bit of lemon juice on Lahmacun. If you like, simply add a few slices of red onion, radish, and fresh mint leaves on top, and wrap the Lahmacun up, burrito-style. OR, to serve a larger crowd, you can slice Lahmacun like you would pizza or flatbread and serve with a drizzle of tahini sauce and a side of this easy Mediterranean salad.You can add favorite mezze. Cook’s Tip for How to Cook Lahmacun on Stovetop: You can cook Lahmacun on stovetop instead of heating up the oven. You will need a large non-stick skillet with a lid. Pre-heat skillet over medium heat and add just a little bit of extra virgin olive oil. Place one Lahamacun in heated skillet and cover with lid. Cook for about 5 minutes until the meat and dough are cooked through. Recommended for this recipe from our all-natural spice collection: smoked paprika, allspice, cumin, Aleppo-style pepper. SAVE! Create your own 6-pack of spices. Try our Greek Extra Virgin Olive Oils. Private Reserve and Early Harvest EVOOs from organically grown and processed Greek Koroneiki olives. SAVE! 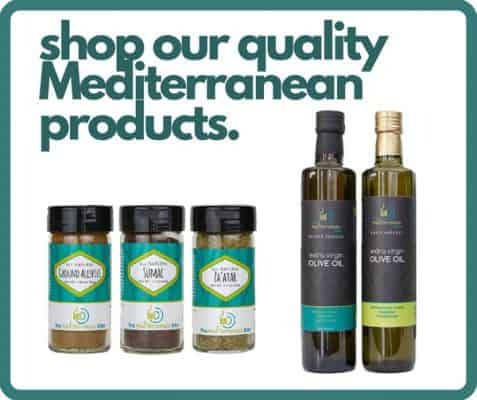 Try the EVOO Bundle! Another outstanding recipe. These were a lot of fun to make too and husband got in on the dough shaping. He worked for almost a decade as a pizza cook and declared that it was something you don’t forget. He did a great job! These were so tasty and the tip about ready made pizza dough was just great. Next time I want to get the meat a bit thinner but the combination with tahini sauce and we also did some of the 3 ingredient salad, just so tasty. Thank you! This might be a silly question but do I cook the meat first before putting in the food processor with the spices and olive oil? Dear Suzy, I beg to differ when I say LAHMAJOON was never a Turkish Pizza….IT IS ARMENIAN THROUGH AND THROUGH….However I agree that chefs in Turkey copied and adopted it. I do follow all your recipes with interest being from Egypt myself….. I have never tried this before but the flavors sound amazing! Kelly, you will absolutely love this! I can’t wait for you to try it. The flavors sound incredible! 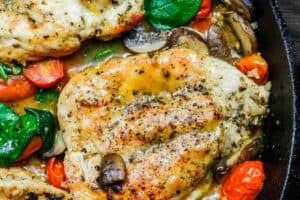 Such a great make ahead lunch or dinner option! I am going to make this recipe with my caulflower pizza crust. Awesome! I can’t wait to hear how it turns out. I had been drooling over the idea of having Lehemejun for weeks and couldn’t find a local place that made them. Yesterday this recipe popped up in my Facebook feed and decided to give it a try. I must confess I was taken aback by how well the pizza dough worked here and how authentic the flavors came out. I honestly did not expect such a fantastic replica of Lehemejun but boy, this recipe is just on point. I will be making it often. Thanks a lot for sharing your secrets! Daniela, I am so excited to gave this a try! Thank you! And so glad you enjoyed it. I learned about a new food today. This sounds like a great game day recipe with such warming flavors. YES! This is awesome for game day! Enjoy. I love learning new recipes from other countries! 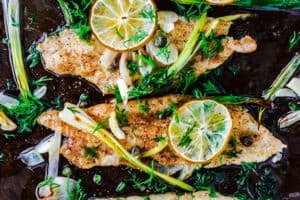 This looks so good and I can’t wait to make it! Yay! Thanks, Katie. I hope you give it a try soon. I have never tried lahmacun, but you have peaked my curiosity! I love the sound of all of those spices on top, it sounds like it would be full of flavour! Oh the flavors here will wow you in a big way! Can’t wait for you to try. This is truly delicious. Thanks for sharing such a unique recipe! Thank you, Carolyn! I’m so glad you checked it out. This looks delicious and I appreciate the extra info about how it is typically eaten if we went to Turkey. Than you, Kristi! Hope you give it a try soon. 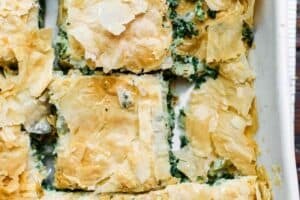 This is my first time seeing a recipe for Turkish Lahmacun but it looks fantastic! I love all the flavors and yet it’s so simple to make! And the fact that I always have fresh pizza dough at the house means I’ll be trying this very soon. Yay, Shanna! I hope you do give it a try soon. This sounds so flavorful! I haven’t had a flatbread like this before, but can’t wait to try it now! This Turkish pizza looks absolutely heavenly! 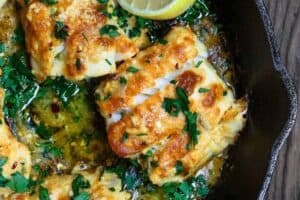 I’ve been wanting to cook more Mediterranean meals. So glad I found your site!